The medieval Flemish town of Bruges is not just a pretty face, it's also very cultural. You may have heard it described as the Venice of the North, or Belgium's answer to Amsterdam. Bruges is a delightful place to visit and, thankfully, English is spoken alongside their native Dutch. In the heart of the city is the quaintly cobbled main square, Markt or Grote Markt. The square was used as an open air market for over eight hundred years until 1983 and was also a place where protesters could be heard and where proclamations were made. These days the market square with its restaurants and bars, framed with impressive gabbled Flemish buildings, remains just as compelling to the modern day visitor. One of its landmarks is the Belfry. The energetic can take a sprint up the 366 steps of the Belfort Tower for a rewarding bird’s eye view of the city. (Entry £1.60 per adult). Having caught your breath after that jaunt, prepare for it to be swiftly taken away again by the stunning Flemish architecture that encloses the neighbouring square of Burg. The shining light of the square is the 15th Century Gothic Hall of the Stadhuis, the Town Hall. The gorgeous stonework looks as delicate as lace and the splendour continues inside with a grandiose staircase, vaulted ceilings and Goth-style wall paintings. On the other side of the square is the Basilica of the Holy Blood. Though small on the outside the interior is surprisingly spacious. The Relic of the Holy Blood is kept in the chapel. In the middle of Burg Square there are always a dozen or so handsome horse drawn carriages who, for a small fee of 25 euros (£16) for up to 4 people, will take you on a 35 minute trot around the cobbled, narrow streets while the driver tells all about Bruges. 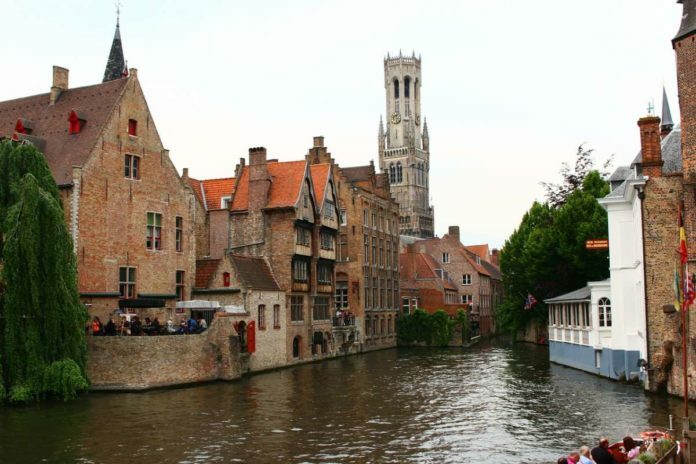 But you may prefer a guided boat tour of bruges – an archway off the square will lead you there. The cost is £3 for half an hour of stressless touring through ancient stone bridges over quiet waters. These well-trodden touristic amusements are highly enjoyable, however, there are other less visited sights which should not be missed. 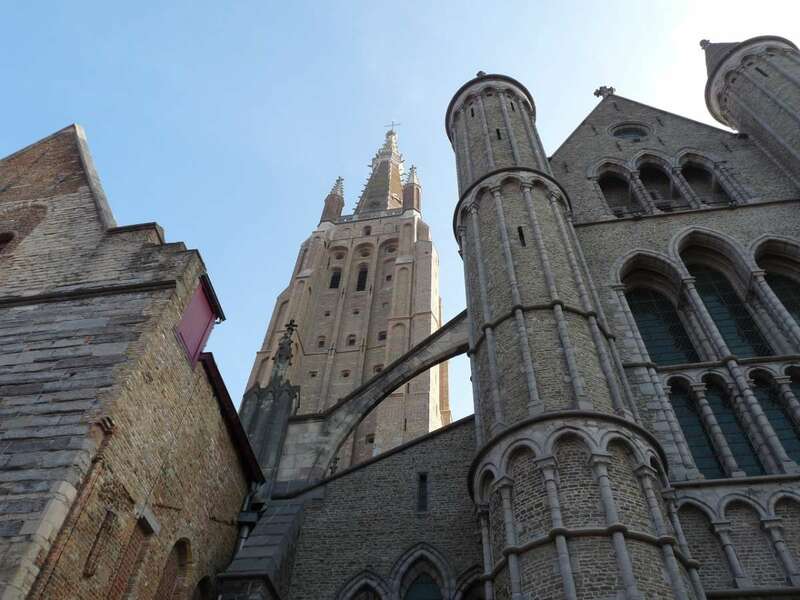 For instance the 13th century Church of Our Lady (Onze-Lieve-Vrouwekerk) has the landmark 400ft spires thrusting upwards from this Gothic Church. Inside, surrounded by grey stone columns is an exquisite white marble sculpture of Madonna and Child created by the famous artist Michelangelo. This is a real treat as his works are rarely seen outside his native Italy. The tombs of Mary of Burgundy and her father Charles the Bold lie in the chancel. Be sure to visit before it closes for Mass at 11.00 am. Those in search of love should take a walk to the Minnewater – lake of love (‘Minne’ means ‘love’ in Flemish). The lake is reputedly endowed with the powers to help you find the love of your life if you desire it. Certainly the romance of the gliding swans helps to reinforce this story. Ironically the lake leads to a 13th century building known as the Beguinage. Though now a convent run by 2000 Benedictine nuns, it was once used as a home for unmarried or abandoned women of material substance. The order was founded by the Beguines – the ladies themselves – but the last of the Beguine died in 1930. For art lovers, the Groeninge fine arts museum displays a formidable range of paintings, generally masterpieces by Flemish Primitives, notably Van Eyck and Memling. Though a little touristy, a quick visit to the Diamond Museum may prove interesting to those who consider this glittering stone to be an art form. Bruges has some interesting shops tucked away in her quaint, pristine streets. For instance, canny fashion lovers can find some fantastic designer clothes at bargain prices at Troc (Korte Zilverstraat 12). Chocolate lovers will have an immense choice but a particularly good chocolatier is Dumon (Eiermarkt, 6) where the pralines are a speciality. Other Belgian gastronomic specialities include sausages, pates and cheeses and interested palates should head for Diksmuids Boterhuis (Geldmuntstraat 23). At some point, hunger pangs will inevitably urge you for nutrition. You could go for the cheap and cheerful but nevertheless historic “frietkoten” vans selling portions of chips with mayonnaise for 1.5 euros (£1). These street vendors have been setting up their stalls for over 100 years. Otherwise choose from one of the many restaurants around Markt Square such as the busy Sint-Joris (Markt 29) where the traditional mussels and chips costs around 15 euros (£9.60). For quality dining try ‘t Huidevettershuis (Huidenvettersplein 10-11), a delightful restaurant housed in an old tanners house dating back to 1450 and has some pretty views over the canals. Expect to pay from around 21 euros (£14.00) per head. All done, it could be time for a beer. Make your way to ‘t Brugs Beertje (Kemelstraaat 5), known affectionately as the ‘brown cafe’ due to its nicotine-stained ceiling. That may not sound appealing, but it is friendly and there are over 300 beers to chose from. A glass of Straffe Hendrik and Brugs Wit (a white beer) costs 2 euros (£1.30). Cheers!